Gestalt (Heya/Keitai, 1999) is an early work by the installation artist Takashi Ishida (石田高志, b. 1972). I first saw it when I acquired Image Forum’s Thinking and Drawing DVD at a screening of Tokyo Loop in early 2007. Ishida’s explorations of shape and form through animated installations have become increasingly sophisticated and bold over the years, yet somehow Gestalt is the work that has made the biggest impression on my subconscious mind. On sunny days like today, when I see patterns on my wall created by the sunlight coming into contact with the with the textures of the wall and the patterns of grain on surfaces of wood, I imagine Ishida’s paint strokes transforming the walls of this unremarkable room into something quite magical. Ishida introduces us to the room with a shot of part of the old window flecked with paint and years of grime, but still allowing some amber light into the room. He then shows us the rough surface of the wall, focusing in on it bit by bit, the rest of the room left unfocused. The camera is then placed with the window on screen right and the wall that will be the central “canvas” for the animation on screen left. There are several different camera set ups in this 7 minute animation. Each one explores shape and form through a pattern of colouring dark on light, filling in space and emptying it again. The artist reprises the shape of the window, his signature swirling lines, and plays with the flickering light, exploring all the possibilities this deceptively simple space offers the creative mind. Gestalt was shot over the course of one year in a Tokyo dormitory. 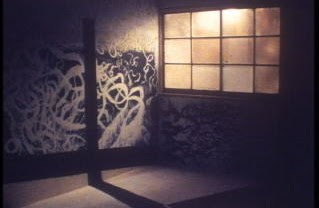 Each day, Ishida would paint on the wall and photograph it using the available light from the window. The flowing lines and play of geometric patterns result in a contemplative piece that is stylistically reminiscent of early experiments with music and animation by artists like Norman McLaren and Oskar Fischinger. At one point, a lone sphere traverses the wall, recalling the classic work Spheres (Norman McLaren/ René Jodoin, 1969), which was composed to accompany Glenn Gould playing Bach. J.S. Bach is also a favourite of Ishida, whose later work The Art of the Fugue (2001) was commissioned by the Aichi Culture Center to commemorate the 250th anniversary of Bach’s passing. The soundtrack of Gestalt features one of Bach’s Great Eighteen Choale Preludes, the hauntingly ethereal BWV 659 “Nun, komm’ der Heiden Heiland” (Come now, Saviour of the heathen) performed on an organ.